The most powerful men of antiquity lived a vegetarian lifestyle and had an energy drink that on first sight sounds plain strange. When today we hear “Roman gladiator” we think about free-for-all bloody fights that end in the death of someone. Not really. It took months and years of training to get gladiators to their fearsome professional level. An expensive endeavor and in terms of return of investment the reason why they didn’t die nearly as often as movies make us believe. No small part in the expenses played how much you had to feed them. 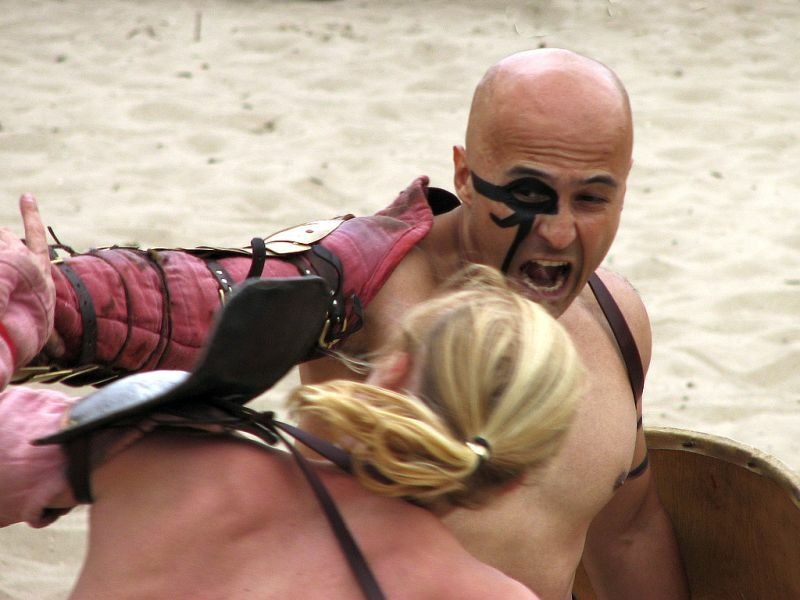 A gladiator trained for 8 to 10 hours per day, which in daily calories is the region of 5,000 to 7,000, maybe more. That led every gladiator owner to a simple financial deduction: you can make a lot of money with them, but the training also costs a lot and the food even more; it’s cutting expenses time! The Romans didn’t know that it was the protein in meat and legumes that was important to build muscle, but they did realize that eating those specific foods helped the process. Meat cost premium back then, so gladiator owners filled plates with beans, barley and lentils. It garnered gladiators the contemporary nickname “hordearii” (“barley munchers”), although I suspect only very few people dared to call them that to their face. All this we knew from antique sources, but so far archaeological evidence for gladiators devouring masses of legumes was missing. Until now, when archaeologists analyzed human bones they found during an excavation in the ruins of the antique city of Ephesos in modern Turkey. These bones date from the 2nd and 3rd century of our time and on some forensic examination showed the various injuries and marks typical for the training and fights gladiators participated in. To learn what the gladiators ate the researchers used a very modern method called “spectroscopic analysis.” With this you analyze the composition of the chemical elements inside bones, which differs depending on what your nutrition was like. If a person’s bones have a lot of carbon of the type “C3,” for example, he ate a lot of plants that store carbon in that way. C3 is the type you get from eating legumes and there was plenty of it in the bones of the gladiators. Like many athletes today, gladiators also had some peculiar nutrition ideas. One was a drink they made from the ashes of burnt plants. This too antique sources mentioned and again the spectroscopic analysis proved them correct. But wait, drinking ash? As weird as it sounds, these men had a point: plant ash is rich in calcium and supplementing calcium makes fractured bones heal faster. And fractures were a common part of a gladiator’s job profile. I’m not sure I’d copy the “ash drink” the gladiators favored, but these findings show that developing formidable amounts of muscle and strength you can do on a mostly vegetarian diet. Pictures courtesy of Søren Niedziella and Hans Splinter. I’m not a vegetarian because I love meat but I think that natural is the way to go!!! I don’t eat a lot of meat, but the occasional piece of it has to be on my table. oh interesting article by the way ! The Roman Empire lasted over 500 years! They did a lot of things right! You didn’t mention it, but I think the general population ate mostly vegetarian also. I wonder if the affluent were actually the least healthy during those days? That’s an interesting question! Already Hippocrates mentioned obesity as a health risk and the physician Galen, living in the 2nd century, treated people for their weight. He classified his patients as “efsarkos” (overweight), “pachis” (fat) or “polysarkos” (obese). Yet those who could afford Galen were quite well off, so I wager that the health problems rich overweight Romans had from their weight were offset by being able to afford better medical care. Such a cool post EC! Fascinating! Drinking ash sounds pretty rough!